In stock -This product will ship today if ordered within the next 26 minutes. Vitamin D is normally produced in the skin after exposure to sunlight, or we get it from fish and animal livers. This vitamin is vitally important for the absorption of calcium, for strong, healthy bones and for building strong muscles, but recent research has also shown it to be of great value in maintaining health in all organs of the body including those of the immune system. 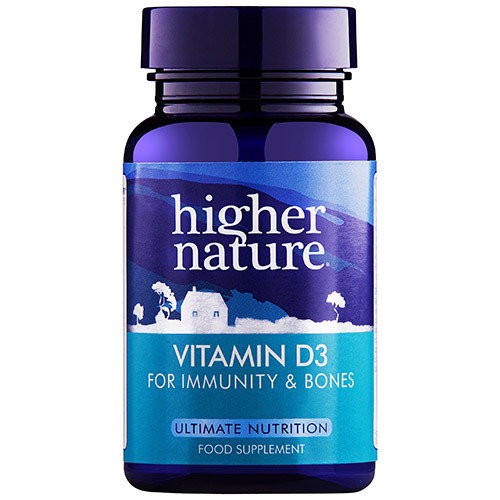 Higher Nature`s Vitamin D is provided in its most bio-available form, cholecalciferol (called vitamin D3), and as an oil in a capsule (tablets of vitamin D are less effective). This Vitamin D is provided in its most bio-available form, cholecalciferol (called vitamin D3), and as an oil in a capsule (tablets of vitamin D are less effective). Sunflower oil, capsule: gelatine (glycerol); cholecalciferol (vitamin D3). Adults: Take 1 - 2 capsules a day with meals, or as your health professional advises. Children over 5 years old: Take 1 capsule a day with meals, or as your health professional advises. If also taking a multivitamin, only take 1 capsule per day. Below are reviews of Vitamin D3 - 500iu - 120 Capsules by bodykind customers. If you have tried this product we'd love to hear what you think so please leave a review. Small easy to swallow capsules. This is at a good dose for long term use, and you can increase if you wish. I find it is absorbed well and well tolerated. I am sensitive to a lot of medicines and supplements bit have had not adverse reactions to this product. Reasonably priced compared to others at a similar quality. Convenient to take and 120 in a tub which makes it worth while buying instead of only 30. Easy way to absorb this very important nutrient which I need due to osteoporosis. Quality product at the right price and so easy to take. Well pleased. These little oil capsules are very easy to take. 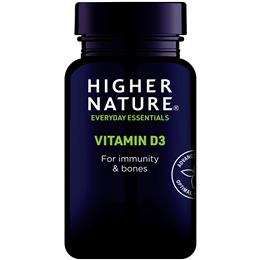 Question about Vitamin D3 - 500iu - 120 Capsules Are these Vitamin D capsules fish oil and are they free from mercury pollution? The Vitamin D is obtained from lanolin sourced from sheep's wool and is free from toxins such as heavy metals and pcb's etc. Vitamin D is vitally important for the absorption of calcium and for helping support and maintain strong healthy bones. It may also be of great value in maintaining a healthy heart and a healthy immune system.